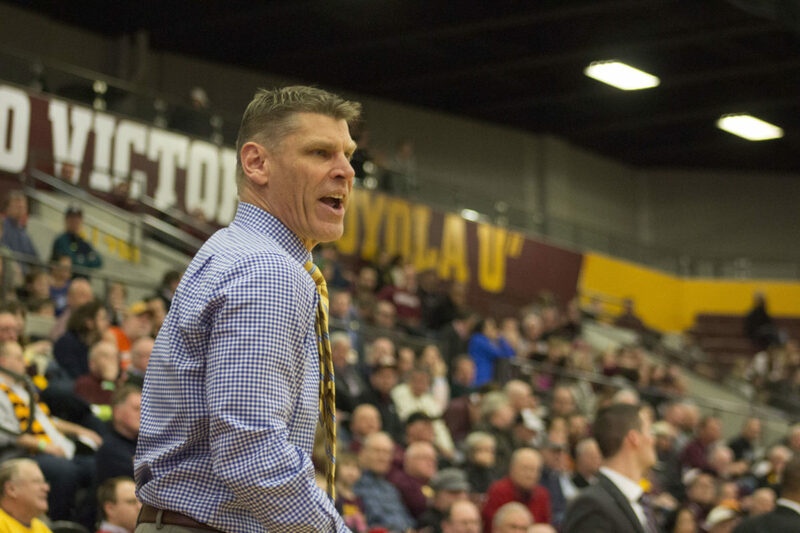 Henry Redman | The PHOENIX Terms of Loyola men's basketball head coach Porter Moser's new contract were not immediately available. A report surfaced Jan. 14 that the NCAA is considering meeting to discuss changes to the transfer rule that would give athletes immediate eligibility when they change schools. The rule would take effect Aug. 1. While many are in favor of the possible change, others — particularly coaches and fans of mid-major conferences — are opposed to it. The rule should stay as is. As it stands now, athletes are required to sit out one season when they transfer schools. The changes could include a GPA requirement to allow student-athletes to be immediately eligible if they transfer before their junior year, according to the report. Transfers happen quite often. An average of 13 percent of student-athletes transfer between four-year universities every year, according to the NCAA. But to give them immediate eligibility is a bad idea because that number will only go up. Mid-major schools are already at a disadvantage to the high-majors. The NCAA tournament selection committee makes it tough for mid-majors to earn an at-large bid. But to give athletes immediate eligibility when they transfer would be devastating for conferences such as the Missouri Valley Conference (MVC). Southern Illinois University head coach Barry Hinson passionately discussed the possible rule change in the MVC coaches teleconference Jan. 15. He said he feels the rule would seriously harm the MVC and other mid-major conferences. Hinson’s right. The rule change would certainly favor the high-major schools because high-major schools would be able to recruit mid-major players away more easily. Loyola head coach Porter Moser addressed the recruitment issues during the teleconference, saying high-major schools would undoubtedly find a way to recruit athletes from mid-major schools through back channels. NCAA rules say players can’t be contacted without a release from the school, but Moser argued that back channels could exist through different contacts. If this rule goes through, mid-major schools wouldn’t only have to recruit future players, but would also have to recruit current players to keep them in the program. That’s not how it should be. Coaches have enough on their plates to worry about without making sure there isn’t a mass exodus of players every year. In 2016, the NCAA allowed graduate students to transfer with immediate eligibility. Illinois State University felt the effects of that as they lost Deontae Hawkins, D.J. Clayton and MiKyle McIntosh — who had the chance to be MVC Preseason Player of the Year — to graduate transfers. That took away three of the Redbirds’ top-five scorers from last season’s 28-7 team, which is why they’re 10-9 so far this year. If undergraduate students get the same treatment, there’s the potential for players who are expected to become building blocks for the future to be poached by higher-major schools, which could leave a lasting impact on a mid-major program. It would be opening a can of worms which would create a free agency-type atmosphere around college basketball. The NCAA has delayed any action to the summer session, so no decision is imminent. I hope the NCAA will realize that of its 32 conferences, 23 are considered mid-major conferences. Despite this, only two mid-major schools — the University of Louisville in 1986 and the University of Nevada, Las Vegas in 1990 — have won the NCAA tournament since it expanded to 64 teams in 1985. The gap between high-major and mid-major conferences is already too wide, and this rule change would widen it even more. The NCAA should avoid immediate transfer eligibility for the sake of the mid-majors. If it goes through, the transfer rate will go up even more. I love mid-major basketball; it’s way more fun to watch than high-major basketball. I don’t want to see it change because of a bad rule.